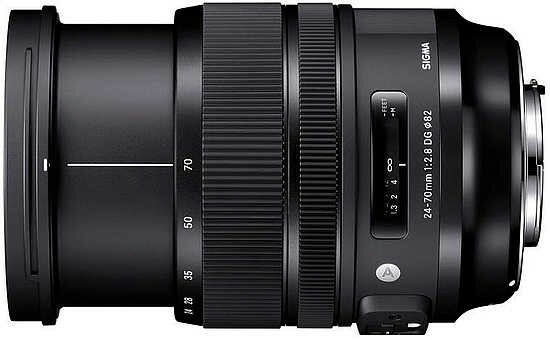 Listed below are some of the rivals of the Sigma 24-70mm F2.8 DG OS HSM Art. The Canon EF 24-70mm f/4L IS USM is a new professional standard zoom lens. Boasting built-in image stabilisation, macro capabilities and fast and quite auto-focusing, the EF 24-70mm f/4L IS USM is a lighter and more affordable alternative to the faster EF 24-70mm f/2.8L IS USM. Read our in-depth Canon EF 24-70mm f/4L IS USM review complete with full-size sample images. The Tamron SP 24-70mm F/2.8 Di VC USD is a fast standard zoom lens for Nikon and Canon full-frame DSLR shooters. Crucially offering built-in image stabilisation, something that the Big Two don't offer, the Tamron 24-70mm is also weather-sealed and cheaper. Read our Tamron SP 24-70mm F/2.8 Di VC USD review to find out if it's the best standard zoom for full-frame users.